Spring 2019 BIC Discussion topics finalized!! We are excited to announce the discussion topics for Spring 2019!! All sessions are on Thursdays and start at 6:30 pm. May 11th - Ground breaking - Peace Garden at UCC (details to be announced). BIC discussions seek to foster genuine understanding, respect and appreciation of diversity among people of faith (including non-theists) in our community. Please bring a potluck dish to pass, if you are able, or just show up for the evening. All are welcome. Invite a friend. 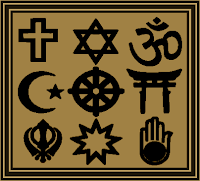 Please be aware that many in our interfaith community do not eat pork or may be vegetarian.The mission of the Brookings Interfaith Council is to cultivate peace and justice by engaging in dialogue to bridge religious and cultural differences and to bring the wisdom and values of our traditions to bear on the challenges facing our society. We encourage you to check out websites of interesting groups like ours that have a collection of excellent articles. 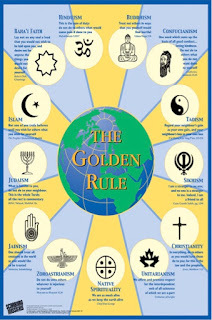 For example, (https://www.scarboromissions.ca/interfaith-dialogue/principles-and-guidelines-for-interfaith-dialogue). 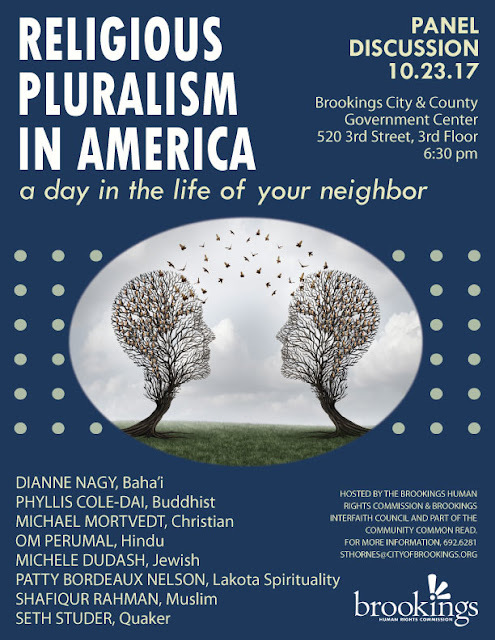 The Brookings Human Rights Commission and the Brookings Interfaith Council will host the Community Common Read panel discussion “Religious Pluralism in America: A Day in the Life of Your Neighbor” on Monday, October 23, 2017 at 6:30 pm in the City & County Government Center 3rd Floor Chambers. The panel will consist of community members from various faith traditions who will provide overviews of their faiths and share their experiences in the community. A short question and answer session will follow. Refreshments will be served at 6 pm, with the forum beginning at 6:30 pm. This panel discussion is one in a series of events in the Campus/Community Common Read program, designed to enhance engagement with the book How Does It Feel to Be a Problem? by Moustafa Bayoumi. In addition to the panel discussion, each week the Brookings Register will publish an article written by one of the panelists. These articles will strengthen community discussion regarding religious diversity by providing a deeper understanding of the panelists’ backgrounds and experiences. Take advantage of this opportunity to unite with the Brookings and SDSU communities to expand our understanding of and appreciation for religious diversity. For more information, please contact (605) 692-6281 or humanrights@cityofbrookings.org. The Fall 2017 Interfaith Dialogues, sponsored by the Brookings Interfaith Council. o Topic: Religion, Race, and Identity. 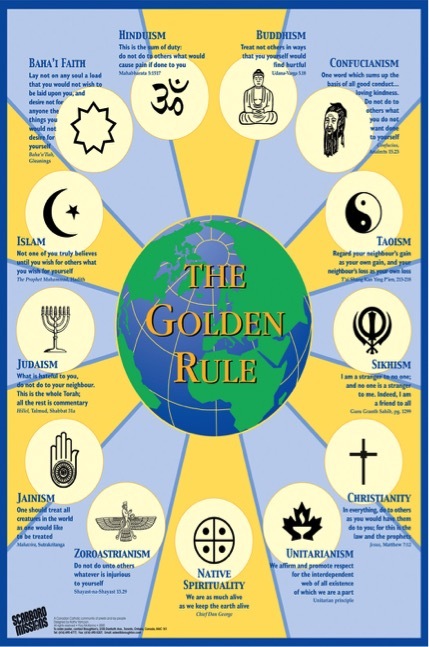 How do our beliefs and our faith communities shape our sense of self and our view of others? o Topic: World Habitat Day. What do our faith traditions tell us about charity, service, and advocacy? o Topic: Collaborating across differences. What can we learn from different faith communities working together? o Topic: Prayer. What perspectives and practices shape your approach to prayer? Also join us for Interfaith Prayer and Reflection on the first Friday of every month, 7:00 pm at the Nagy residence, 1936 Orchard Drive. All are encouraged to bring and share prayers, poems, scripture, music, and anything else that moves you. These gatherings are intended to foster spiritually heightened conversations, fellowship, and common cause. For more information, contact Dianne at 605-695-7596. The Brookings Interfaith Council and the Brookings Human Rights Commission are collaborating to make Brookings a more welcoming community. Over the past year, Brookings residents have expressed increasing alarm at the welling divisiveness rippling across the country. 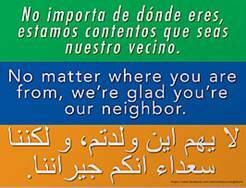 The Brookings Interfaith Council submitted an application for a micro-grant from South Dakota Faith in Public Life to blanket Brookings and its environs with yard signs that read in Spanish, English, and Arabic, “No matter where you are from, we’re glad you’re our neighbor.” The plan was to provide around 40 Interfaith Dialogue participants with a sign to display at home and one to give a like-minded neighbor. This would visibly promote inclusivity and propel participants to reach out to their neighbors, build bridges of connection, and open further dialogue. This plan was shared with members of the Brookings Inclusivity Team, a task force of the Brookings Human Rights Commission seeking to help implement the Brookings City Council’s recent Resolution of Inclusion (a Resolution Reaffirming Brookings Values of Inclusion, Respect, Tolerance, Equality and Justice, and the City’s Commitment toward Action to Reinforce These Values). When the Human Rights Commission learned the application was selected for funding, they generously offered to collaborate on the initiative, thereby tripling the number of signs. The free yard signs are available to Brookings residents on a first-come, first-served basis with a limit of two per household. Signs may be picked-up at the Brookings City & County Government Center, 520 3rd Street, Suite 230. Please remember, signs must be placed in your yard, not on the boulevard or public property. 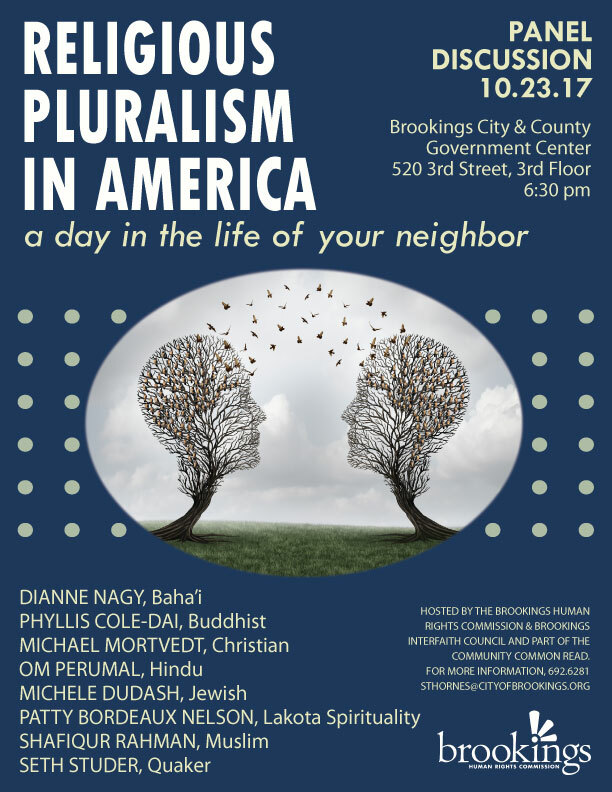 The Brookings Interfaith Council brings together Brookings-area residents from various faith backgrounds for monthly potlucks and discussions on themes spiritual, ethical, and cultural. · The study of the existence, character, causes and extent of discrimination in employment, housing and public accommodations, property rights, education and public services. · Advise and provide a forum for those subjected to unfair and discriminatory practices in the City and County. · Advise City officials concerning issues of discrimination. · Conducting educational programs and disseminating information to further the commission’s policy to eliminate discrimination in the city. · As appointed by the Mayor, serve as the lesbian, gay, bisexual and transgender (LGBT) liaison for the City of Brookings.